Cameroon education - The english angloxazon education system. The English Cameroon Education System. Cameroon Education- The The British Anglo-Saxon System of education. The Cameroon elementary education . The Cameroon british anglophone system comprises of a seven years of primary education consisting of Class one (1) through Class seven (7) of primary elementary education. At the end of Class seven (7), the pupils sit for the First School Leaving Certificate examination (FSLC) which certifies them as haven finished the primary or elementary education of Cameroon. For students wishing to enroll in secondary school education they are expected to sit for the Government Common Entrance Exams. The results of this exam is divided into a List A and a List B. Top students are place in List A and enjoy preferential treatment as to the schools they get admitted into. Cameroon Education - They Student is then grilled for five (5) years of secondary education which consists of Form One (1) to Form Five (5). The curriculum of study comprise all subjects from Home economics to physics and everything in between. By the end of Form 3 students are expected to select between an Arts or Science course of study. So studies between Foms 4 and 5 are more specialized and geared towards the final exams. At the end of Form 5 the students sits for the General Certificate of Education Ordinary Level, (Cameroon GCE O/L). The Cameroon GCE O/L consists of a broad selection of over 25 subjects examined during the course of two weeks. The student can select a maximum of eleven subject to sit from a Science based list or an Arts based list. 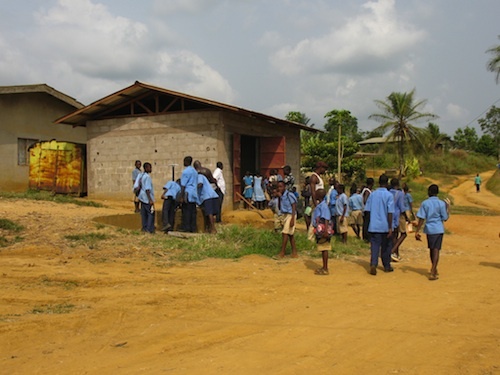 Hence, Cameroon students often describe themselves as science or Arts students in Cameroon schools. The result is graded as A, B, C D, E and F grades with A being the best grade possible. Successful students are those with a passed grade (A, B or C) in four or more subjects. Cameroon Education - The students then seek for competitive admission into the very few good fee-free government high schools. These schools attract the best of the student and with limited classrooms sizes admit only a very few percentage of the secondary school graduates. The wealthy and more affluent families send their children to the private mission run schools. These missions schools are very expensive by Cameroon standards costing between a thousand to two thousand dollars a year for tuition, room and Board. With large family sizes in Cameroon and high unemployment rate only a very few well-off families can afford that sum of money per child per academic year. A third option for the students aside from the government schools and mission-run schools are the vast private schools run by individuals on a for-profit basis. These private schools range widely in reputation. Majority are poorly run and educational standards are very poor. Student performance at the GCE is very poor for these schools. Even when these schools achieve a level of disciple and student success rate, the owners are driven by greed to maximize profit resulting in reduction of student out put and performance. While these private schools are not cheap either, they have schemes in place to work flexibly with parents to ensure the completion of a child's education. Thus for the underachieving students from a poor family the only option will be the private school system. With a collection of such student making up the bulk of a private education section the study environment is less competitive, less challenging, and this is reflect in the schools performance at the GCE exams. Cameroon Education - The high education system of Cameroon is a two year course of specialized study based upon the students decision at the secondary education level i.e if a student decided to be an Arts student and sat for the GCE O/L Arts exam their fate is sealed going forward. In high school they could not get admitted into a science course of study. The curriculum is comparable to a United States freeman and sophomore course of study or a community college standard. Upon completion of the two years the student sits for the Cameroon General Certificate of Education Advanced level, (GCE A/L). The maximum number of subjects a student can sit for is five (5) on either Arts or Science list. The student's performance is graded on a letter system as A, B, C, D, E and F. A point system is offend used by the University of Buea to sort the students and admit the best into the University. On the point system F is given zero (0) points, E is given one point , D is given 2, C is given 3 , B is given 4, and A gets 5 points. Thus a student can get the maximum of 25 points by sitting for the maximum subjects (5) and getting all As to make 5x5 = 25. It is very uncommon for a student to get 25 points. Each year, of the thousands of students only a handful i.e less than 10 get over 20 points. These are certain of admission in any university and department they apply to in Cameroon and abroad. The Cameroon GCE exams is highly regarded in the world. Top graduates go on to do exceptionally well in many university around the world including US Ivy league schools.